About living upstairs is I can pop up to grab snacks. 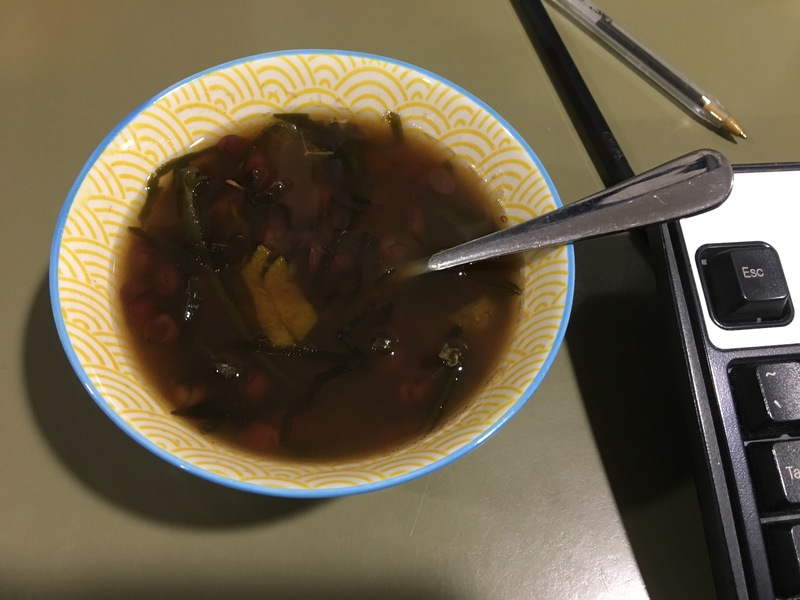 Red bean, seaweed and kumquat sweet soup. Had to go upstairs to find a pair of socks. It’s cold. Have also turned the heater on. My hamper is pretty much nearly done. Took a set of make up, body scrub and hand cream from the shop. Have bundled them up with mum’s earrings and two bottles of wine. I think that should do them. That’s another one off my list. Went in before to book activities for the exchange student. Taking her to Healesville Sanctuary. I’ve booked close encounters with the kangaroos and koalas as my youngest couldn’t decide. Luckily I decided to book now as there might not be any sessions available come that day. They tend to be booked out quite quick. Then bought tickets to the football that night. We’ll brave the cold and go. Since we don’t buy membership we had to buy public tickets and well only got middle tier as the good ones are expensive and all taken. We will decide what to do on Sunday when she comes. We might pop her in the car on Saturday night after the football and drive her down to the hidey hole. That way the next morning we can head to Lorne or Port Campbell. The hidey hole cuts our travelling time by about an hour and a half. Either that or we’ll go for a walk along the beach then catch the ferry back to Melbourne via Queenscliff to Arthur’s Seat to take the skylift. Bugger they are closed that weekend. Guess that option is out.